Despite the scandals Facebook has been entangled with over the past 12 months, the world’s largest social network remains a popular source of news for Americans, far ahead of any other social network. 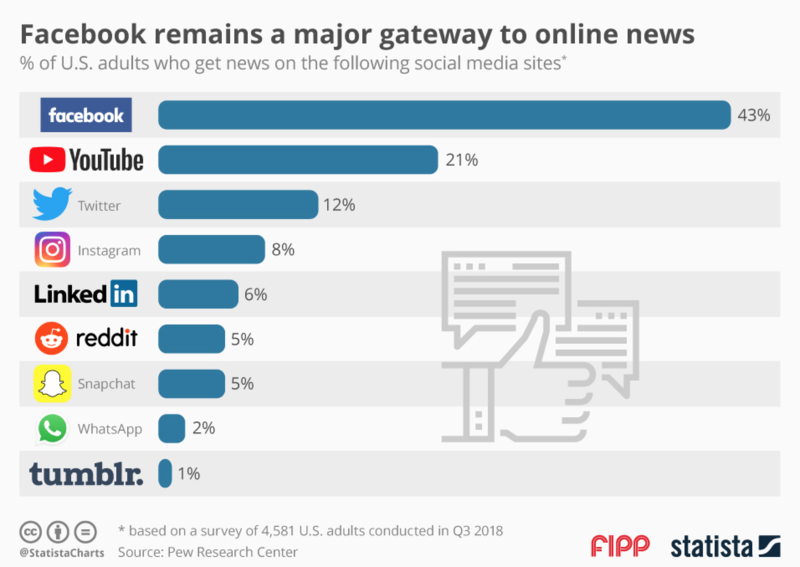 According to survey data published by the Pew Research Center, 43 per cent of US adults get news on Facebook at least occasionally, with YouTube (21 per cent) and Twitter (12 per cent) the second and third most popular social platforms for news. In light of this year’s revelations about false information deliberately and systematically spread via social media, it’s no surprise that news consumption on social media didn’t grow any further this year. According to Pew’s findings, 20 per cent of American adults get news on social media often, while 27 per cent do so sometimes, both unchanged from 2017. Interestingly, more than half of social media news consumers expect the news they see there to be largely inaccurate. So why bother in the first place, one might ask? According to the survey, it’s the convenience of getting news on social media that people like most about it. But does that outweigh the disadvantages of inaccurate information? To some it does apparently. Chart of the week: Poor journalism more prevalent than actual fake news?